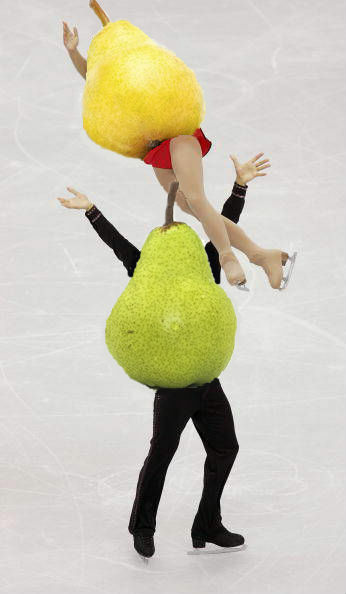 The inaugural Pears Skating competition made its successful debut at the Winter Olympic Games in Sochi with the United States’ Justin Pearson and Anna McPeary stealing the show in a gold medal victory. Pearson and McPeary executed a flawless, energetic performance to Little Richard’s “Tutti Frutti,” which secured a first place slot for the duo. After impressive routines from Russia’s Evgeny Pearavlenko and Marina Shapearoshnikova, Canada’s Genevieve Montpear and Alex Pearier, Italy’s Paolo Pearazza and Teresa Napearliello, and Japan’s Pearushi Nashimura and Eipeariru Yamanashi, Pearson and McPeary had to deliver in the face of tremendous pressure. Fast forward to 2014– McPeary and Pearson brought their FDA approved A game. The duo executed a wide variety of technical elements, many of which are unique to pear skating. The judges and audience were treated to a tasteful blend of triple fruit loops, pear spins, twizzlers, citrus twist lifts, pulp throws, and antioxidant benefits. Their strategy appears to have worked. After these games, McPeary and Pearson look forward to training for South Korea in 2018. “With any luck, you’ll see us on the new figure skating team,” said McPeary. If this year’s delightfully fruity showdown is any indication, we have not seen the last of this bunch. Tags: 2014 winter games, figure skating, fruit, games, ice, ice skating, olympics, pairs skating, pears, russia, skating, sochi, Sports, team, USA, winter olympics. Bookmark the permalink.